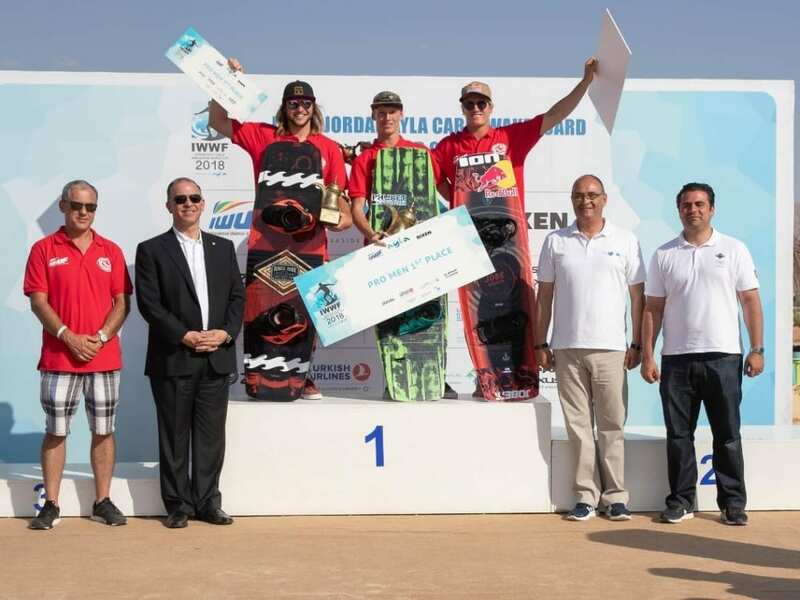 Conditions were once again ideal for the final day of the 48th IWWF World Cup stop, the IWWF Jordan Ayla Cable Wakeboard World Cup, at the Ayla Cable Wake Park in Aqaba, Jordan. 16 Open Men in the semi-finals were split into two groups to compete for the eight places in the final with the best four from each group advancing. Miles Toller (GER), Pedro Caldas (BRA) and Sam de Haan (NED) improved on their first-round scores to secure their positions in the final whilst Liam Peacock (GBR) just fell short with his improved second pass losing out to Sebastian Dunn (AUS). In the second semi-final, first off the dock Ariano Blanik (GER) set the benchmark with a Pete Rose 540 and a score of 70.00. Koki Toyoshima (JPN), Hamid Khodsiani (IRN) and Riccardo de Tollis (ITA) all improved on their first-round scores but not sufficiently to threaten the leaders. IWWF Junior World Champion in Mexico, Oliver Orban (HUN), Ariano Blaniik (GER) Dominik Gohrs (GER) and Louis Mistaudy (FRA) all advanced into the finals. First rider in the Women’s Open final was Courtney Angus (AUS) who wowed the crowd with a clear pass including a 360 Transfer off the fun box. Only Julia Rick (GER), last of the dock in the final, was able to top Courtney’s score with a Backside 540 off the kicker, 90210 and 313 and, despite failing to complete her last trick, took the lead. Only Steph Caller(GBR) was unable to improve on her first-round score, but it was Maxine Sapulette (NED), Courtney Angus (AUS) and Julia Rick (GER) who finished on the podium in 3rd, 2nd and 1st place respectively. In the men’s finals Dominik Guhrs (GER) had a great ride including a Backside 720, a big air KGB, and a 315. Initially only Pedro Caldas (BRA) failed to improve on his first-round score. Louis Mistaudy (FRA) with a Toeside Blind Judge, a big air KGB and finishing with a Backside 720 off the kicker jumped into 2nd place. Ariano Blanik (GER) then blew everyone away opening up his run with a toeside backside 900 and landing a Double Half Cab Roll to take the lead. By then lying in 2nd place, and last off the dock, Dominik Guhrs (GER) fell early conceding victory to his fellow countryman Ariano Blanik. 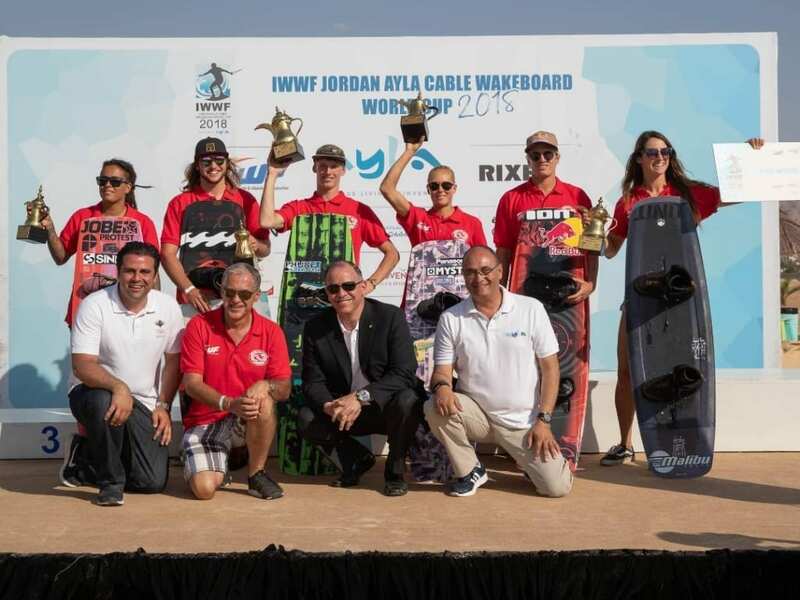 IWWF President, Jose Antonio Perez Priego, thanked his Royal Highness, the hosts Ayla, the Jordan Olympic Committee (JOC), the sponsors, the volunteers and riders and officials for making the event such a great success. 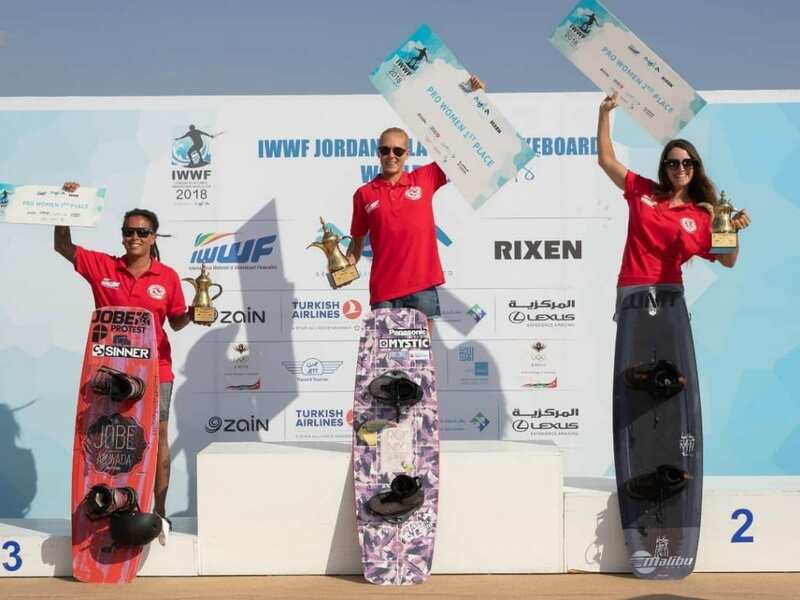 At the same time a letter of co-operation was signed between Ayla, the Jordan Olympic Committee and IWWF for the development of towed water sports in Jordan.